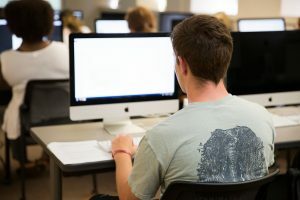 Allison Hetzel, a professor in the Department of Theatre and Dance, shares how she manages her online courses and offers tips for connecting with distance learners. How do you reduce anonymity and build community in your online courses? I work to connect with my class as often as possible. I make sure that I am part of the class conversation in discussion and blog posts. I often send group messages to the class with any reminders and updates related to the class. How do you manage online teaching? I check my email and class messages early and often. I try to respond in a timely matter, and since I do not see these students in the classroom, I think it is important to build and keep a good rapport with them. I also let my students know when my office hours are in case the students are local and want to stop in. I actually had my first visit from an online student this semester. He had never taken an online class before and had some questions about how to get started. We had a short how-to session, and it was great to meet one of my online students in person. I offer my students detailed examples when I share feedback on assignments. This technique helps them prepare for future assignments. Do you incorporate any active or collaborative learning? My students participate in the online blog and discussion. This activity is a large part of their participation grade, and I think it helps the classroom community and students get to know each other. I would like to incorporate additional active and collaborative online activities in future online courses. What tips do you have for first-time teachers of online courses? Do not be afraid. The College of Continuing Studies is great resource. I was terrified at first as I am not what you would call tech-savvy, but if there is a problem, the CCS tech support team is wonderful and can help me handle it. Teaching online is flexible and works with my schedule, so for me it has been both an enjoyable and rewarding experience. Hetzel is an associate professor of voice and acting in the Department of Theatre and Dance. She teaches Introduction to Theatre online.